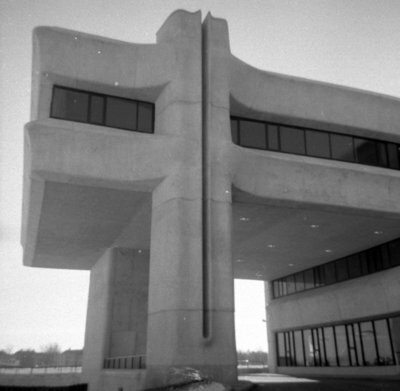 A black and white photograph showing the outside of the the Dr. J.O. Ruddy General Hospital. The Dr. J.O. Ruddy General Hospital held a tour of their new facility in December 1969. It is located on the west side of Gordon St, midway between Victoria St. and Lake Ontario. It is now called Lakeridge Health Whitby. Tour of Dr. J.O. Ruddy General Hospital, 1969, Brian Winter. Whitby Archives A2013_004_374.